There are multiple ways to setup a highly available ADFS server farm. One possibility is to install multiple federation servers using the default Windows Internal Database. In that case, the first federation server is designated as being the ‘primary’ federation server. Every subsequent federation server that is added to the farm will be a ‘secondary’ federation server. These secondary federation servers periodically poll the primary federation server for configuration changes and replicate these changes across. By default this is every 5 minutes. This scenario is especially useful if you do not have a SQL server available or if you cannot make your SQL server highly available but still want to increase resiliency for your federation server farm. Note when using the Windows Internal Database instead of SQL, you are limited to a maximum of 5 federation servers in a farm. There was an error doing synchronization. 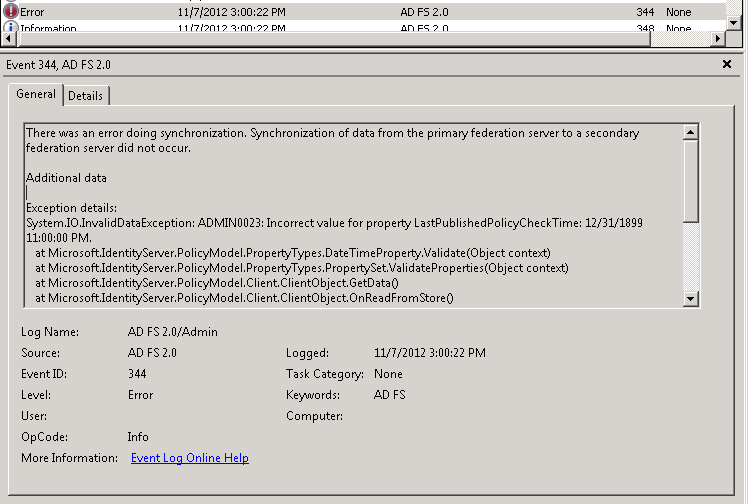 Synchronization of data from the primary federation server to a secondary federation server did not occur. System.IO.InvalidDataException: ADMIN0023: Incorrect value for property LastPublishedPolicyCheckTime: 12/31/1899 11:00:00 PM. Make sure the primary federation server is available or the service account identity of this machine matches the service account identity of the primary federation server. In this specific case, the customer decided to geographically spread the different AD FS servers to increase the (site) resiliency of their federation server farm. However, this particular secondary federation server was located in a different time zone than the primary federation server. It seems that AD FS cannot handle the time zone difference by itself (unlike e.g. Active Directory that reduces time back to UTC). After changing the time zone on the secondary AD FS server to match the time zone of the primary AD FS server, replication started working.